The socialization of media is the undercurrent for the Industrial Revolution of our time. Yet, here we are today, forcing social media into the aging paradigms that the social revolution set out to upset in the first place. Businesses still weigh the ROI of participation. Teams debate over who owns the company’s social presences. The parochial in middle and upper management see it as either a playground or an extension of existing broadcast channels. Champions believe it is a time to engage and improve experiences. Visionaries recognize its ability to socialize the entire business. Yet, almost every example we see today of successful social media endeavors is in reality, siloed and disconnected from the rest of the organization. Marketing runs a creative contest on Facebook, but the rest of the business is unaware of the campaign. Customer service reacts to customer problems, yet product development is unaware of the recurring problems and themes. Representatives are unwittingly diluting the brand they represent with unguided tweets, updates, posts, comments, and videos. HR monitors the mistakes made by employees, but no one guides them through training, guidelines, or branding. Customers ask questions about products and services and while these updates show up on the monitoring reports of community managers, they do not receive a response from the sales team. The list goes on and on with little resolution as we are focused on real-time vs. real world. We need not only champions, but we now need leaders to help us cut through the red tape and unite the organization behind a flag of relevance and evolution. Everything starts with recognizing that we must cater to an audience where its parts are in fact, greater than its sum. We must partition our social strategy to engage the diversity of the social consumer and address the unique requirements and attention of each. This is about humanizing not only the brand, but also the methodologies that govern customer relations and adapting the systems that support it. sCRM is the hot ticket in enterprise 2.0 at the moment, yet its champions are mired in technology as are the champions for social media in general. In many ways we’re blinded by the networks and our need to listen, respond, and update. But, we miss the intimacy necessary to learn, adapt, and earn relevance. And now, we’re consumed with wiring Twitter, Facebook, LinkedIn, Foursquare, Yelp into our existing CRM infrastructure to help us automate enlightenment and engagement. While we close gaps caused by the distribution and scale of social web and the people who define it, we fail to see the human touchpoints to connect with the right people in the right places at the right time. That is, after all, where scalability resides; the ability to engage influential consumers in a one-to-one-to-many practice to amplify intention, purpose, and value. Essentially, we’re practically fooled into a belief that we should not over think social, but not doing so, we trivialize the opportunity, ultimately investing in a program that at the end of the day, falls short of meeting the needs of the social consumer. What is a Twitter Follower worth? What is the significance of a Tweet, check-in, or comment? How do we reduce the costs of support through social? To answer these questions, we must have a vision of the experience and actions we wish to introduce into these rich and active social ecosystems. Yes, this is a “click to action” and in order for businesses to socialize CRM, they must socialize the entire business. Not all of the 3F’s (friends, fans, followers) are created equally. Individually, rarely collectively, they are looking for substance, direction, recognition and even empowerment. 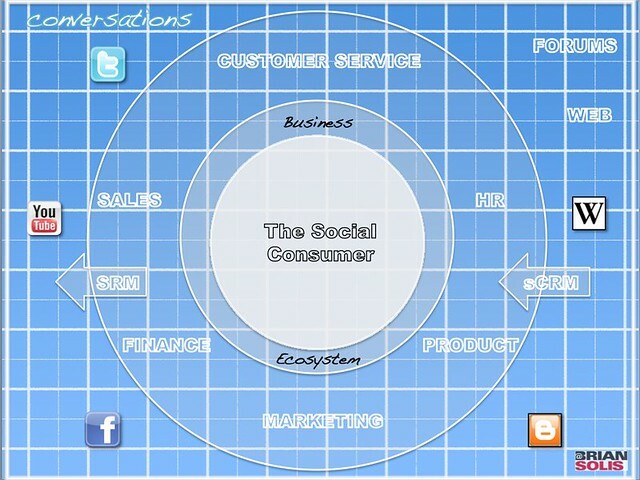 In order to activate the social web and unlock meaningful conversations, we must look beyond customers. We must officially recognize all those who influence their actions and introduce a conversational workflow that traverses the business chasms to learn and lead – in public. One of the celebrated companies renown for its innovation in social customer service is actually a lesson in how social “anything” becomes great PR. When you look behind the scenes, you actually see more duct tape and rubber bands than fluidity and polish. Business units are still siloed and even the chief executives have gone on record saying that the acts of engagement do more for the company’s PR than it does for the improvement of products and services. Just look at your favorite social media source and you’ll see an endless array of examples of how brands are succeeding in social media. Again, most of them are basking in the brilliance of individual victories, some are actually breaking through the internal barriers that prevent collaboration, and others are simply stunts designed to spike conversations, sales, and PR. Nothing wrong with it…especially if it work as intended. You and I are here together, right now, to do something greater. It’s up to us to lead the way for the socialization of business, understanding that it’s an uphill journey for the foreseeable future. But in the end, our experience and triumphs are unparalleled. Social media are the goldmines of anthropology, sociology and ethnography. To excel here, we must embrace social science to create and earn relevance. Some businesses already get this. For example, Intel employs anthropologists such as Genevieve Bell to understand how certain cultures adopt technology and also how products should be designed with humans represented in every step of the process. I challenge businesses seeking to socialize their business to hire social scientists to not only understand culture and its role in consumerism, but also to humanize the processes and systems erecting to facilitate engagement and social CRM. It takes a human touch to embrace and inspire the social consumer, build communities, and activate advocacy. If we can hear, see, and feel the customer and all those who influence them, then why would we think social is where we can excel. Surely, it’s not because we show up. It’s only because we earn and deserve our place within each network. We must humanize our brand, our products, and our processes to improve and influence experiences. Doing so will help us find our voice, our mission, and our purpose…our cadence. Give people a reason to connect with us, trust us, and represent us. Now, once more…this time with feeling. Are there no linear graphics for the conversation old friend? Or I know, even a ball or sphere!! That would more appropriately represent the 3 dimensional nature of our surroundings – wouldn't it? No seriously, you are right Brian. Earning is the hard part, don't we know? Think 3D like Cameron tho bro. Brian, I obviously don’t have to reiterate how amazing your post was. Especially for me, coming from a social science/anthropology background. Quick question though – While I understand (and agree with) your argument completely, I can’t help but wonder… do you know of any specific examples of companies out there that ARE doing things as you suggest? Or is this more of an abstract goal that companies must constantly strive to achieve? In many ways, Zappos, Dell, and GiantNerd are moving in this direction…but it’s also written to help companies constantly trying to achieve something of greater significance. Wow the timing of this post could not be any better. I was just having an internal discussion about our Enterprise2.0 path and how humans and culture need to change to really see the leaps in change that are going to be needed for businesses and people to really see the change we are all hoping for. I am going to post internally to further my perspective. Hope you don't mind….. Agreed and brand doesn't Tweet people do. It takes many organisations a long time to reach this point of understanding and I would value your views on how to get from silos to socailising an entire organisation set in its way. Brian, really like this post. 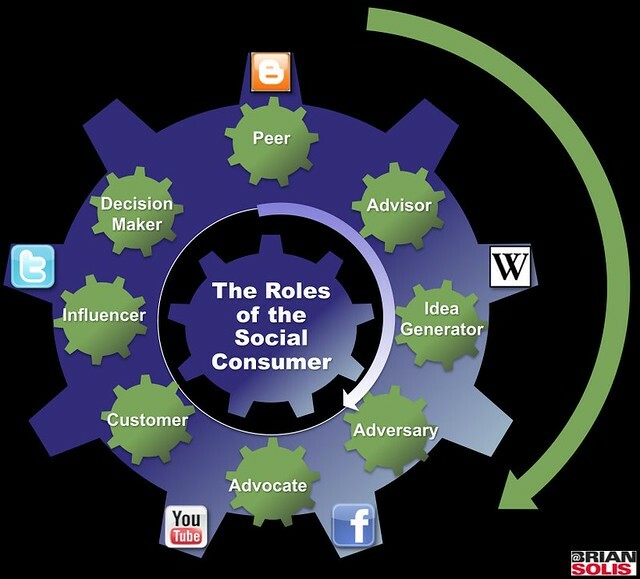 What it brings to mind for me is that social strategy and social business can't be distilled into a single definition. We need social leadership and culture nurturing, which paradoxically take a great deal more time than the urgency of the web would like to allow. We need management and integration of people, of systems, of goals and vision. And we need coordinated execution that's also capable of mining for learnings and insights and bringing them back into the organization for absorption and adjustment. The cycle itself has to change, which is exactly what you hit on at the start. We're trying to put so much of what we're learning into familiar constructs, but the reality is that we have to be willing to examine and rework the very foundations of some of what we're doing in order to enable the rest. That takes courage and faith and reinvention, which are not always compatible with things like “risk” and “ROI”. But I for one am devoted to chipping away at that, as I know are you. Thanks for pushing the big discussions forward. Amber…indeed. This comment give me goosebumps. You have distilled in two paragraphs why the world doesn't need social champions or programs managers as much as we need leaders and architects + patience and perseverance. We are building the business of the future and at some point we need to get in front of… everything. Wow! Never commented here but just had to stop & say “Excellent synopsis Amber!” I've been chipping away on my end as well & always knew I wasn't alone out here, however; our kind sure are few and far between. One day we'll have that changed. Amber. Wow. Brian awesome analysis (as usual). This is the shift that must take place, culturally, top down. As for chipping away at this… I lose sleep trying to stay ahead of this and bring new foundation building ideas to senior management teams. Some get it, some don’t. Soon they will. Good stuff book spouse. The problem is that the VAST majority of companies do not see it this way (yet). To them, it’s all about the media (which requires no reinvention) and very little about the social (which clearly does). It’s pretty tough to walk into a boardroom – even with the persuasive firepower of you or Solis – and convince a CEO to fundamentally transform their business and how they organize their personnel, when all they care about is number of Twitter followers. I’ve dealt with a lot of big brands in the past few months, and their utter lack of interest in making anything but tactical adjustments to succeed in social and real-time makes me think the revolution is going to take longer than the readers of this blog anticipate – or desire. I hope I’m wrong, I really do. And I am 1000% convinced that everything you and Brian said here (and everything you and I recently wrote) will come true. But it’s not coming true right now. It’s a bridge too far at this point. I used to think we’d get there via epiphany. “This is either a huge opportunity, or a huge problem for our business. We need to retool fundamentally.” Now, I’m starting to believe that the transformation is going to happen as a RESULT of the tools mindset, not instead of it. Once companies have invested a bunch of time and money to “win” in social media, they’re going to have to helicopter up the debate to be “what does “winning” actually look like”? Why do you buy a car? Not to have one, but to get you places. Why do you buy a sCRM system? I’m not sure most people know the answer today. I’m hoping that by connecting the operational and transactional dots, the bigger/harder questions of culture and customer experience get addressed along the way. This is the world in which I live. In fact, one Fortune 500 company that I’m working with turned into a 3+ year adventure in which we redesigned (ing) the infrastructure from the top down. It’s been both tremendous and arduous. But I realized that in order to convince and convert “open leaders,” they need a little help…and it doesn’t necessarily unfold because they suddenly realize the potential of social media. It happens because they can see the benefits of how SM along with other variables starts to impact the bigger picture and the bottom line, much like the book “Competing for the Future” taught us. My focus over the last several years past and also ahead, is aimed at the c-level. I spend most of my time now with executives (not the c-level at first, but those who report to them), who realize the opportunity and work the political machine to get the job done. It’s a combination of change management and organizational transformation, but it’s also propelled by playing the game internally. This is where most new media consultants fail. It’s not enough to get these social presences online, we need structure, organization, guidelines, direction, and collaboration. We start to bump up against the roles that management consultancies such as McKinsey aim to address. So now, I find myself working with the change management team to modernize the complete workflow and process. Social media was simply the catalyst to start the domino effect of humanizing the entire business while making it more efficient. You will see more posts from me about this now…as I’ve decided it’s where I will remain focused over the next few years…that and anthropology and philosophy. Love the post. You're on a level of your own, Brian. May I respectfully ask: “Almost EVERY example… of successful social media endeavors… siloed and disconnected from the rest of the organization.” ?? Not doubting here, just curious… Really? Almost Every? I agree with this post and appreciate that is hitting the nail on the head. My experiences with large corporations is that they realize the benefit of social media and collaboration, but how to achieve one voice within they are feeling at a disadvantage due to unable to break down the silos fast enough. As you state above you have worked with one company for 3 years, as it is a monumental task for the large corporation. Talking and promoting definitely will help to chip away, and push the process ahead, and prevent retreat. I was quite happy to find one corporation putting an effort to become social and collaborative within first, and now pushing this outward – of course this is where the issue of concern comes into play – 'can we trust employees with company information and confidentiality'. BUT, I am finding that is seen as less of problem after the internal social network built. LOL. I was going to reply from a change management perspective, until I got to the end of your reply. It is a process. An issue that constantly plagues OD consultants is that leaders, see issues as an issue and that it is not related to anything else. I wish! Eventually every part of the organization will be socialized it is just still new and we need to stay open-minded, patient, persistent and to think outside the box. Actually…going from a bottom-up, outside-in approach to a renewed top-down, inside-out cycle. Great post! From a marketing point of view I would also say that instead of doing multi (which for me equals with parallel acting) channel, we’ll have to go to omni channel where every channel is linked and assures the customer a great buying experience. 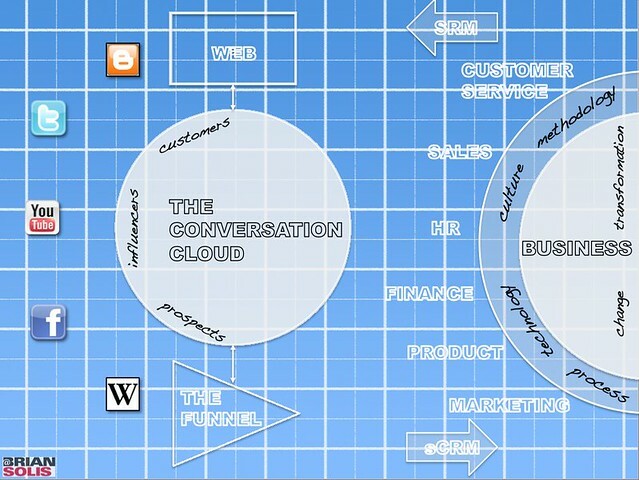 This post encapsulates many of the underlying themes that have emerged out of the current ‘socialization of business’. This socialization is taking place against a backdrop of the inevitable convergence of the ‘real’ and ‘virtual’ worlds. The disjointed and fragmented landscape that is emerging and evolving for now, will I am sure, in time give way to new ways of working, communicating and engaging with each other. The 95 theses contained within the Cluetrain Manifesto, written in 1999, seem so prophetic now. Your post which avoids the usual misplaced rhetoric, vacuous soundbites and hackneyed management clichés is written with an eloquence of voice and elegance of structure that lends full weight behind the central message that you weave: we are in a time of change, and in times of change, leaders emerge. However, there is a fundamental difference in how this change is unraveling. In the past, leaders controlled the channels of communication. We, the audience – the bystanders and participants, willingly, unwillingly, perhaps even unwittingly at times looked to these leaders, to these somewhat enigmatic, yet charismatic few who were blessed with a presence that captivated, commanded, and at times demanded our attention. The difference now is that a channel of expression, what we loosely term social media, has been democratised. These social tools, blunt as they may be, together with the smartphone, gives to each one of us, not only the power of individual self expression – I can be heard, but more importantly, the notion that our collective voice can be united: we can be heard. We, now, each one of us, has the ability not only to listen, but to be heard and in so doing to ferment change. Each one of us can be a leader in our own way. It is not good enough to look elsewhere any more. That convenience has been taken away. The conversations we have with each other not only inform the change, they represent the change that is taking place. Our paradigms, constructs and artifices are shifting. Our once hallowed and enshrined concepts of business are being questioned, cajoled, provoked and challenged in the belief that the possibility of something better lies just ahead. We are all being awakened from our comfortable slumber. The conversations taking place stand for these new paradigms. The marketplace that The Cluetrain Manifesto talked about, or at the very least its foundation, in a sense, is finally being built. We are seeing the rise of people networks and the emergence of self-branded ecosystems where information is exchanged, knowledge shared and help provided. These networks and ecosystems built on trust. Here, people are helping each other, and in so doing, redefining the notion of the company, how business is to be done, and even the language of business. From a social customer care perspective, for example, empathy is now part of the everyday lexicon, customer care is no longer simply a transactional and process-driven interaction. In many respects the experience has superceded the drive for a resolution within three minutes. If your washing machine breaks down, your first port of call is likely to be Google, not the manufacturer. Customer care is decentralizing in a sense. As Jeremiah Owyang wrote, companies are now having to ‘fish where the fish are’. A fundamental paradigm shift is taking place. Companies can no longer pay lip service to their customers. Mission and vision statements, customer charters are no longer decorative wall hangings: companies now have to deliver on the promise of them as well. Whilst I am not convinced that social is the answer, it is without doubt, along with the increasing ubiquity of the smartphone catalytic in influencing this change. Added to this, the current economic climate is forcing each one of us to reassess our status quo. I am a great believer that it requires a number of different factors to be present for change, behavioural change to take place. In my mind, these factors are coming together. On the one hand, we are carrying the weight of our industrial past on our shoulders, whilst on the other, looking at the possibility that something like augmented reality might bring; two diametrically opposite worlds. Out of this tension between past and future, change is emerging and it is time for all of us to lead the way forwards now. mentioned, social media leaders will help chip away at the old constructs, and this evolution will happen quicker. Love the post Brian. Made me think. Full comment below, in answer to Amber’s.